Just because the temps drop and the days grow shorter doesn't mean that fruits and vegetables stop growing. Cold weather crops, the use of hoop houses and other methods that extend the natural growing season, and old-fashioned storage vegetables like cabbages and potatoes, all mean that there are plenty of winter fruits and vegetables to choose from across most of the country. For the best flavor—and greatest value—while shopping at farmers markets and in produce departments, look for the winter fruits and vegetables that are in season. Specific crops and harvest dates will depend on your region's climate, and most of the produce (beyond root vegetables) are only available locally in regions that enjoy a more temperate climate. Beets are in season in temperate climates fall through spring, and available from storage most of the year everywhere else. Fresh beets are often sold with their greens still attached. Beets are wonderful roasted and made into a salad. This type of lettuce is mostly "forced" to grow in artificial conditions, and are thus available year-round. Their traditional season (when grown in fields and covered with sand to keep out the light) is late fall and winter. They are delicious braised or in salads. Like many cruciferous vegetables, broccoli can be grown year-round in temperate climates so we've forgotten it even has a season. But, like the rest of its family, it tastes best (that is, more sweet, less bitter and sharp) when harvested in the cooler temperatures of fall in most climates. Turn this vegetable into a soup or cheesy casserole. Although it likes similar cool growing conditions, broccoli rabe (also called rapini) is a more bitter, leafier vegetable than its cousin broccoli. Saute some up and add to a couscous salad. Brussels sprouts grow on a stalk, and if you see them for sale that way snap them up—they'll last quite a bit longer than once they're cut. Otherwise, grab a bag and roast with some balsamic vinegar. This coleslaw standard is bright and crisp when raw and mellows and sweetens the longer it's cooked. The cooler the weather it grows in, the sweeter it tends to taste (this effect is called "frost kissed"). There are stuffed cabbage rolls in many cuisines from around the world, including Vietnamese and German. This somewhat unusual vegetable tastes a lot like artichokes but looks more like celery. If you can find cardoons, look for firm, heavy-feeling stalks. They have to be cleaned and prepped a certain way and can be incorporated into a Moroccan tagine dish. Carrots are available from winter storage from local growers in many areas and fresh in warmer and temperate regions. You will find them in a range of colors, from the typical orange to purple and white. Carrots are, of course, delicious raw, but equally as good when roasted or even grilled. Although cauliflower may be grown, harvested, and sold year-round, it is by nature a cool weather crop and at its best in fall and winter and into early spring. Look for heads that are void of any brown or soft spots. Combine with potatoes for a lower calorie mashed potato side dish, or add some Indian spice for a tasty roasted cauliflower recipe. Not the prettiest of vegetables, celeriac looks like a knobby bulb covered in hair-like texture. It is at its best in the cooler months of fall, winter, and early spring (except in cold climates, where you'll find it during the summer and early fall). The root of the celery actually has a nice, mild taste and texture similar to a potato. A classic French recipe is a creamy celeriac salad with a mustard dressing. Celery is at its best in the fall, with its harvest continuing through winter in warm and temperate climates. We are all familiar with celery as a garnish in a Bloody Mary, but it can be so much more; try it in a casserole with an almond topping or in an elegant but simple crab salad. This cool weather crop comes into season in late fall and lasts in temperate climates through early spring. Use the vegetable instead of escarole in an Italian wedding soup. These small, sweet oranges are available from December through the winter. They are seedless and easy to peel and delicious eaten out of hand. Best stored at room temperature, clementines can be kept in a bowl on the counter for easy access. This delicious citrus can be added to a salad or baked into a cake. This type of chicory is at its best in fall and winter. It is made up of a bushy head of lacy-textured leaves that have a strong, bitter taste. You will find frisee in the classic French salad with lardon, as well as the traditional Dutch potato dish called stamppot. Another bitter chicory, this green is in season fall and winter. Escarole is less bitter than its fellow chicories, but the bitterness does range throughout the head of lettuce. It can be cooked in many ways, from grilled to sauteed to incorporated into soups. Escarole can also be eaten raw in a salad. Fennel has a natural season from fall through early spring. Like most cool weather crops, the plant bolts and turns bitter in warmer weather. The white bulb base sprouts short celery-like stalks with fronds that look like dill. You can serve fennel raw in a salad of grapefruit and arugula, or roast it to bring out its sweet flavor. Grown in California, Texas, Florida, and Arizona, grapefruit comes into season in January and stays sweet and juicy into early summer. A delicious and refreshing treat when eaten halved and sectioned, grapefruit is also wonderful as part of a cocktail or a turned into marmalade. Although best in fall and winter, like so many other root vegetables, horseradish stores well and is often available in decent shape well into spring. The long, tapered, white root is covered with a kind of brownish "hairy" skin and should be firm. Make your own horseradish vodka, or grate fresh horseradish into a creamy dill sauce. These brown nubs look a bit like small pieces of fresh ginger. Look for firm tubers with smooth, tan skins in fall and winter. Slice thinly and fry up as chips to top an elegant ravioli dish, or grill simply with oil, salt, and pepper. Like all hearty cooking greens, cooler weather keeps kale nice and sweet. You may find a few different types of kale, with curly kale being the most common. Keep the green raw and incorporate in a variety of salads; it is also delicious braised along with aromatics. This egg-shaped fruit with a fuzzy skin grows on vines and is harvested winter through spring in warmer and temperate areas. Kiwifruit should be firm without any blemishes but have a little give when ready to eat. You can cut in half and use a spoon to scoop out the bright green flesh speckled with tiny black seeds. Or, turn into a luscious ice cream. The word kohlrabi is German for "cabbage turnip," and once you see one of these vegetables you will understand why. The green or purple bulbs with cylindrical stems come into season by the end of fall but stay at its sweet best into winter. Look for small bulbs for best flavor and texture. Use in a mustard-flavored slaw at your next barbecue. This teeny tiny citrus fruit is completely edible—peel and all. Shaped like an oblong orange, the kumquat has both a sweet and tart flavor that can be enjoyed out-of-hand or added to salads. You may also want to try a kumquat cream pie. A member of the onion family, leeks are more than 1 1/2 inches wide and tend to have tough inner cores. The top green leaves should look fresh; avoid leeks with wilted tops. Feature leeks in an impressive chicken dish at your next dinner party, or add to a potato-crust quiche with mushrooms. These bright yellow citrus tend to be at their best winter and spring. Meyer lemons are sweeter than regular lemons; because of their thinner skin, they are more difficult to ship so you may have a harder time finding them. If you do get your hands on some, try a Meyer lemon pound cake or a light and fluffy mousse. Both of these fruits are sweet and juicy in winter and add sunny brightness to winter eating. Choose citrus that is heavy in the hand without any cuts or mushy spots. Both Mandarins and regular oranges are wonderful eaten as is, but you may want to try a Mandarin orange cheesecake, or Moroccan oranges with cinnamon. Easily mistaken for a white carrot, parsnips have a great nutty flavor. Look for thinner parsnips, since fatter ones tend to have a thick, woody core you need to cut out. They are delicious roasted as well as made into a velvety soup. Available for a short window in the fall and early winter, this round, bright red or orange fruit looks a bit like a tomato. Choose shiny fruit that is heavy in the hand. Add to a quick bread or liqueur. These large, sunny grapefruit-like fruits are common in Asian cuisine, but you may be able to find them at your supermarket during the winter months. Pomelos are bigger, sweeter, juicier, and milder than a grapefruit and are a nice addition to a Vietnamese shrimp salad. Like all chicories, radicchio is sweeter and less bitter when the weather is cool. With its round shape and purple color, radicchio looks a lot like a small cabbage. The bitterness can be lessened by sauteing. Also look for Treviso, the longer, slimmer, more elegant version of radicchio. Also known as "yellow turnips" and "Swedes," rutabagas are sweet, nutty root vegetables perfect in stews, roasted, or mashed with plenty of butter. Available in winter, look for purple skin that is free of blemishes and any green shoots. Purple-fleshed and brown skinned shallots bring part-garlic, part-onion flavor to dishes. Choose shallots that are firm and heavy for their size without any sprouts. They have a bit of a bite when used raw, but mellow significantly when cooked. Use in a vinaigrette or turn into a flavored butter. Tangerines are oranges' sweeter, more honeyed cousins. As with all citrus fruit, look for specimens that feel heavy for their size. Use in a raw citrus kale salad or add flavor to a margarita. This vegetable has gotten a bad rap it doesn't deserve. Fresh turnips have a sharp but bright and sweet flavor. Look for turnips that feel heavy for their size. Make into a casserole or a smooth, creamy soup. Squash of all sorts come into season in early fall and usually last well into winter. Look for acorn, butternut, Hubbard, spaghetti, and kabocha, to name just a few. You want them to be heavy for their size and free of bruises and blemishes. 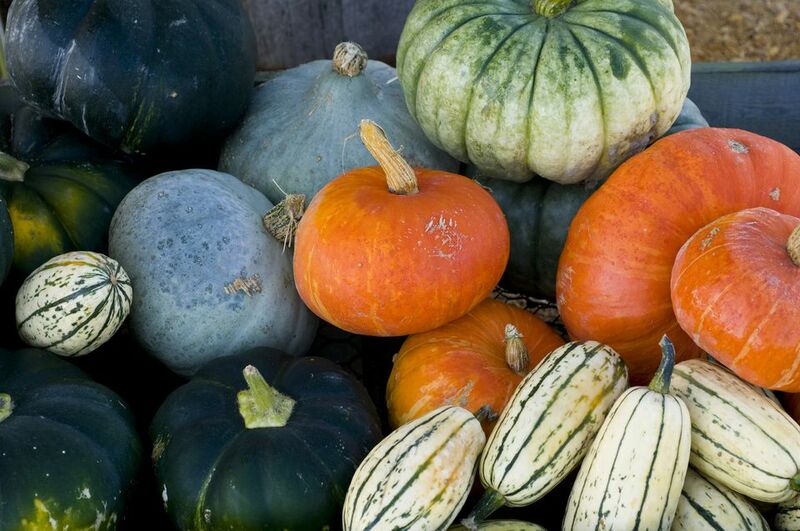 Winter squash can be used in a myriad of ways, from roasted to stuffed to pureed into a soup.